Hay Brett, Do you trust dad's driving? Big rain/storms expected down here. Might need a tarp. Great looking bike and ute. Bold color choice (not on the bikes). As for the ute, more like the Chevy El Camino or Ford Ranchero, both of which they should bring back. more like the Chevy El Camino or Ford Ranchero, both of which they should bring back. I couldn't see any forum tee's or Trevor "bike beeza" there. 2018 BSA International Rally has been run and done. A fantastic week of rides out, to some interesting locations and spectacular scenery around the Grampians area. A seemingly never ending supply of food at every stop with great dinners and even breakfasts if you opted for them. 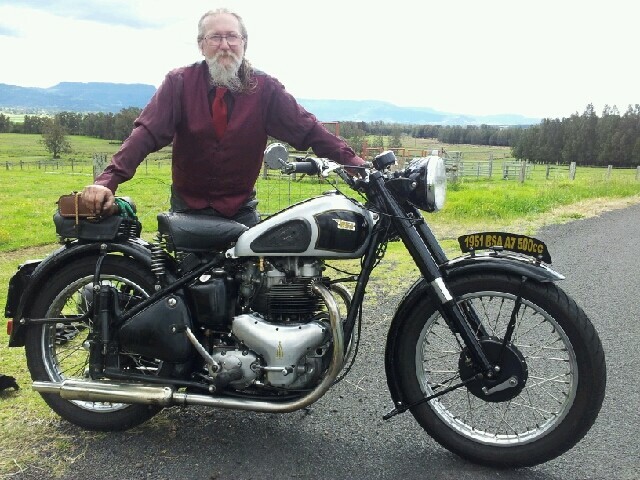 A truly we'll run rally, and so good to see so many overseas guests and BSA enthusiasts from far and wide here in Oz. Also some great guest speakers and other activities for the evenings, even the weather was perfect for the whole week of BSA enjoyment. I'll try to de-size some photos, but here's a pic of me and the wife with our BSAs out front of the Ararat prison for the criminally insane. Have now updated the 2018 Bsa International rally Album. over 540 photos of bikes, people, sights etc. Be sure to check it out as was some really great machines and matching people to have some laughs. I had a fantastic time at the rally, too (my first International). I did wear my forum t-shirt - for a few days. As Muskrat has encouraged us, I believe that it's to recognize each other, and make a personal acquaintance. I did actually put a call out, quite awkwardly (on my iPhone, at the rally). This thread is on the "members chat" child board, and thanks for those replies. As I then recorded, I was pleased to track you down (by conversation with Steve Arthur), Trevor (BSA_54A10), and have a brief chat - thanks. I was sorry that you couldn't make it, Muskrat (Trevor explained, you were shifting house). I connected with you, too, Thomas - and now realize you are "Beeza". Of course your Project Daytona thread has been fascinating, on this forum. Seeing your actual project and the story - was a highlight, of the rally. Then the actual dispatch record, for the same bike, being part of Brian Pollit's talk - was a bonus. You and your committee were fantastic. I hope this upload of a picture of the 3 of us (me on left) works - we did most of the planning, to get our own bikes, very successfully, there and back from NZ. Not shown is our octogenarian "mascot", Graham Stott - although that's his 1950 Gold Star, behind. He presented the gift from our club, and delighted us with his running starts (jumping on side-saddle) and backfiring loudly through all the quiet towns. I'm now trying to attach what we call our "normal view" of him..